An exciting project offering learning experiences of Italian language and culture to foreign tourists, residents, students and travelers. A new way to learn and speak the language, through the use of colors, flavors and scents typical of the places where Italian words were first coined. A global approach, from the language and sensory point of view, will guide the participants in the heart of the Renaissance, to disclose ancient and new situations and curiosities. Linguistic tours that will take you off the beaten path, to discover the Florence of the Florentines. Filing involves a group of Italian teachers who have been working for many years with foreigner residents, or visitors to Florence and Tuscany. Very often, what attracts foreigners to Italian is their love for this country’s culture. The project was designed to meet this need, combining the language opportunity with the keenness in the Italian lifestyle and culture. Filing offers authentic language and culture experiences, through routes that vary depending on the different levels of language competence through meetings/classes combining play and work. – Itineraries that cross charming hidden spots in Florence, such as its gardens, cafés, libraries, museums, theaters and much more. The teacher will give the students the linguistic means they need to “survive” the initial impact of everyday Italian life, beginning with “ il bar”, the most typical setting for Italians and foreign visitors. Through exercises and games, the participants will learn to introduce themselves, order and have breakfast, pay, meet and greet others. 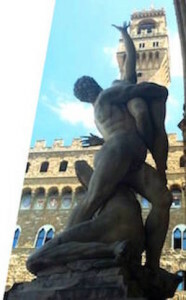 The two-hour meetings will take place in various cafés in Florence. Availability: Wednesday and Saturday mornings. A language booklet will be supplied to participants. Do your shopping as you roam from stalls to shops, in one of the most popular places for Italian, the market. 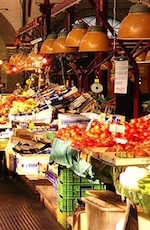 Wandering through the historical Florentine markets such as San Lorenzo, Sant’Ambrogio, and Santo Spirito (Sunday market) you will learn to ask for information on the produce, using various styles and subjects: buying food, clothes, and window shopping. Asking to try on clothes, asking for sizes, amounts, learning what to say when you pay, and before you leave. This meeting will teach you the Italian you need to survive in these circumstances! Wandering through Florence can make you thirsty, and having a gelato or a cocktail, is a lovely way to continue your sightseeing exploring the habits and tastes of this town, still using the language and keeping a watchful eye on quality and tradition. Participants to this itinerant class will meet the teacher in Piazza del Duomo or in Piazza Santa Croce, where they will decide where to go. If you feel like cocktails or hors d’oeuvres, Fiaschetteria Nuvoli is the place to go. The cozy tavern offers interesting starting points to speak Italian, and to learn the names of the typical produce and their various adjectives. In wintertime, you can choose to snack on a cup of hot chocolate with a slice of the famous Torta Pistocchi, in the elegant cafés in the center: Caffè Rivoire, in Piazza della Signoria, l’Arte del cioccolato, near the Duomo. Among tasty bites, images and word games, you will learn the words you need to explore the world of chocolate. In springtime or summer, gelato is the best snack: at Rivareno in Borgo Albizi or at Perché no!, midway between Piazza della Signoria and the Duomo, to explore the tastes and hues of the true Florentine gelato. A linguistic itinerary in four stages, to discover the Florence of the Florentines, setting off from a café to explore gardens and libraries. Featuring active listening and speaking, the four appointments combine linguistic study and culture. Meeting point in Piazza delle Murate: formerly a nunnery and later a jail, the complex of the Murate is one of the most striking and culturally active spots in town, a must-see if you want to discover contemporary Florence. Through the Mercato di Sant’Ambrogio, you will then reach the Biblioteca [Library] delle Oblate, with its breathtaking view of the Duomo. The large library and its many rooms offer the participants unique linguistic inputs. Meeting point at Ponte Vecchio to introduce ourselves and start the day. Breakfast in a very original, posh café and then a stroll along the river Arno to discover some of the loveliest bridges in the world and the relationship the Florentines have with their river. We will reach the Giardino delle Rose, a small jewel off the beaten path that will offer unexpected surprises. 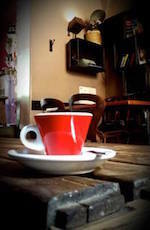 Meeting point in Piazza Santo Spirito, in the heart of one of the most authentic and charming neighborhoods in town. A stroll through the alleys Vasco Pratolini described in his books will take us to Piazza Tasso and then to the recently refurbished Biblioteca Pietro Thouar. This appointment will give you the chance to leaf through the books displayed in this interesting library, read and play with excerpts of the classical and contemporary Italian literature, and with the newspapers and magazines of the library. Meeting point in Piazza della Libertà, just outside the historical center, to introduce ourselves and have a cup of coffee at one of the new cultural spots in town, Caffè dello Stensen. After coffee we will head to one of the most interesting gardens in town, popular with the locals but often overlooked by the classical tourist itineraries. A mixture of architecture, nature, social solidarity and a small library will give us the starting points for learning activities. Minimum 3 participants per meeting. Cristina Tosto teaches Italian to foreigners; she obtained the DITALS Certificate from the University of Siena to teach Italian as a Foreign Language, and a degree in Moral Philosophy from the University of Florence. She studies the didactics of Italian for foreigners as an instrument of inter­linguistic and intercultural comparison. A lover of grammar, language and its sounds, she is responsible for the promotion of reading, creating and running literary events in libraries, schools and literary cafes. She actively collaborates with the cultural association “La Nottola di Minerva”. She has been working as an editor in Italy and abroad for many years. Michela Negri teaches Italian to foreigners; she obtained the DITALS Certificate from the University of Siena to teach Italian as a Foreign Language and her degree in Esthetics from the University of Florence. Her polyhedral profile lists her as a teacher of history and philosophy in public and private high schools. She has been working as a volunteer with foreign immigrants in Italy for several years.